William Mugge or Mudge was appointed Warden of the College of St George, Windsor Castle, in 1349, the second cleric to hold the post after the foundation of the College in 1348. He was to serve in this office (subsequently renamed Dean of Windsor) until 1381, combining it with a number of other ecclesiastical positions as was common at this time. These included Prebendaries at Exeter, Lichfield and Crantock, the Archdeaconry of Barnstaple, the office of Treasurer at Exeter Cathedral and the Rectory of Crewkerne, Somerset. The image of the month features his seal, which is attached to a document dated 20 March 1356 [SGC X.1.3]. The document executes a grant by William Mugge to the College of St George of two messuages and a croft in Datchet, near Windsor. Although it might seem strange that the Warden would endow his own institution from his personal property during his lifetime, it is likely that he was hoping to establish an obit or chantry in St George’s Chapel to ensure that masses would be said in his memory after his death. His obit was indeed kept in succeeding years on the anniversary of his death on 20 February 1381. He was buried in the original St George’s Chapel (on the site now occupied by the Albert Memorial Chapel) under a fine brass, subsequently removed and found, considerably damaged, with its face downward in the Dean’s Cloister. It now forms part of the pavement in the Oliver King Chapel. 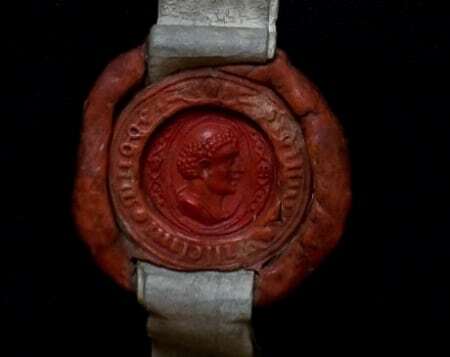 The wax seal attached to the deed of 1356 is of some interest in itself. Made from beeswax coloured red, it has survived remarkably intact, protected by the wax ‘frame’ into which it has been fitted. In the centre is an image of a tonsured head, indicating that this is a seal belonging to a priest, surrounded by a decorative border incorporating the initials W and M. The raised mount bearing the legend ‘sigillum willehm mugge’ confirms the ownership of the seal. The image and lettering appear in relief meaning that seal matrix which made the impression on the wax was incised with the design, a technique known as ‘intaglio’. The seal is also noteworthy for being made from two or three cakes of wax. The outside ‘frame’ is clearly formed from an additional piece of wax applied to the base of the seal to protect it and to affix it to the parchment tag. It is possible that the raised mount is made from a further, third, piece of wax, fused together with the inner impression prior to fixing it to the tag and the wax frame. If so, it would make the seal highly unusual. Whether this is the case or not, the seal in its final form is the product of considerable skill and is a striking example of a medieval personal seal belonging to a priest.